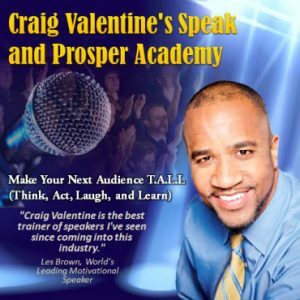 Craig Valentine is the President of The Communication Factory, LLC, which is an award-winning company that helps organizations embrace change. You are truly the best speaker I have ever heard and my first day back in my sales territory I was charged. I let everyone know how you changed us with you dynamic inspirational speech. Your message…is tailored to the spirit that is required to motivate yourself permanently, and ensure personal growth. We broke a district record by selling 154 registrations. All of us realize that this success was a direct result of our keynote speaker. Thanks for a great contribution to the Spring Conference. Once again, your presentation was outstanding! Later in the conference, we were able to refer back to many of the change-based topics you covered. Bravo! Thanks again Craig and I look forward to working with you again in the future. Hi Craig, Pat…incorporated your suggested changes into his presentation with spectacular results. Today we garnered appointments with 95% of all the folks in the room. It was our best ever – so ten thousand thank yous! I cannot express enough “thanks” for your presentation. I believe that your presence…challenged our office to make significant changes and accept the year ahead. My Chief, was “highly” impressed by your presentation and not only laughed throughout your speech, but used some of your speech to make his presentation about upcoming changes in the year ahead. I just returned to our office after hearing you speak at our annual kick off and award ceremony. You have impressed many of our employees and managers to step up to the plate and take a good look at ourselves. I hope everyone is motivated to imagine us at our best and then to GO FOR IT! You were great! WOW. Just saying ‘thank you’ would not do justice to how appreciative I am that you came to speak at our Open House. Your speech really inspired the audience and your abilities were praised long after you left the room! We had quite a few enthusiastic individuals sign-up.. I am sure due in large part to your motivating words. All in all, the Open House was a great success – and we’re so happy you were a part of it! You were WONDERFUL!!! Everyone is STILL talking about you!!! I am even trying to practice your tips! You made me aware of ‘practicing’ and putting my learning to use daily! I would like to congratulate you because in the survey we got from our participants your workshop was ranked the best among the other workshops! Thanks again for coming to Sloan Business School – you are a rock star!